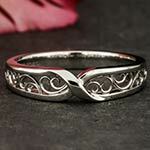 Nothing is ever truly lost or broken. We can fix it! Nothing lasts forever despite even our greatest hopes that it will. 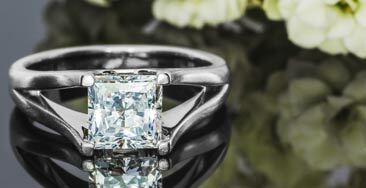 What’s more, there are just some things that are easier to fix than others, and fine jewelry isn’t necessarily one of them. 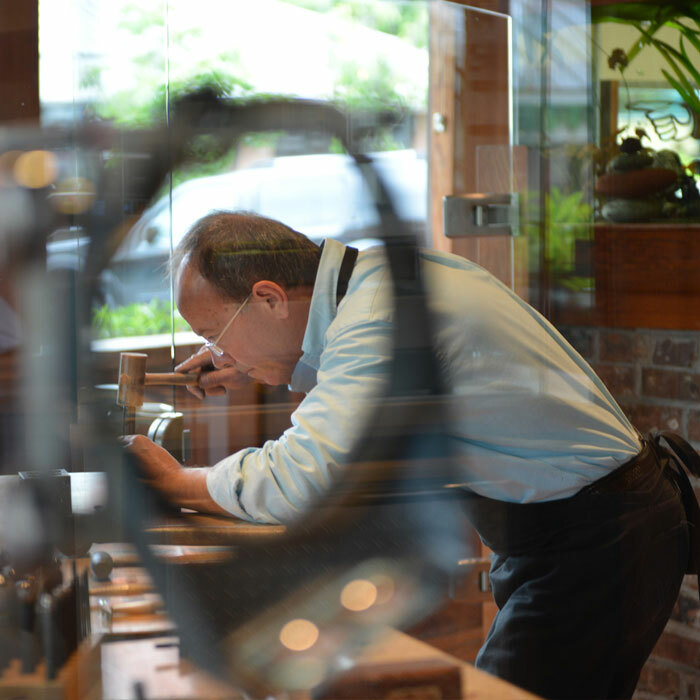 At Green Lake Jewelry Works, we know restoring jewelry to its original luster requires a lot of creativity, experience, and above all, honesty. 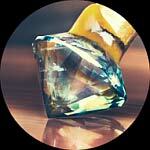 Our master jewelers are rich in these qualities and uniquely capable to take on the most daunting of projects. 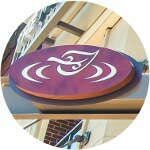 See below for examples of past restoration. Ever lost something and given up on ever finding it again, only later to find it in the most curious of places? 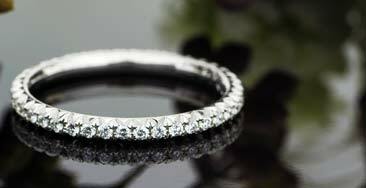 Well, that’s exactly what happened to this platinum and diamond baguette designer eternity band. It was lost and found years later in a parking lot, where it apparently endured a long while of being repeatedly run over, before settling into a crack in the asphalt. 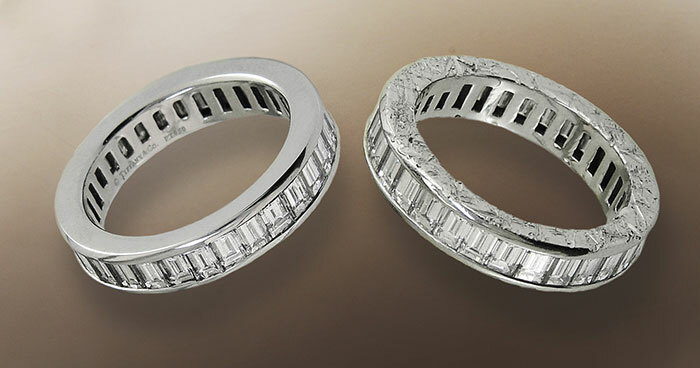 At Green Lake Jewelry Works, a restoration specialist was able to employ new techniques in laser welding and fill the rings deep gashes with fine platinum wire. 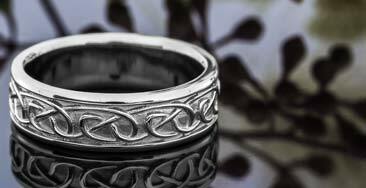 The end result was a seamless finish that made the ring good as new! 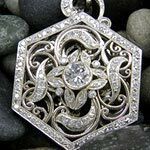 Perhaps the most challenging aspect of this restoration is that it had been repaired by others many times over the years, leaving a trail of inexpensive solder and quick fixes to work around. 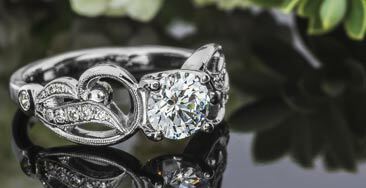 After repairing the main plate and burnishing the platinum back into place, this early brilliant cut diamond halo sparkled once again, and this time for the long term. 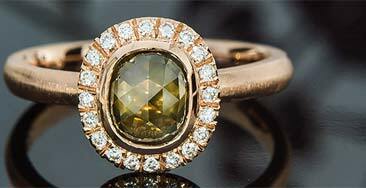 So worn the center gemstone had fallen out, this antique estate ring had past its prime years ago. 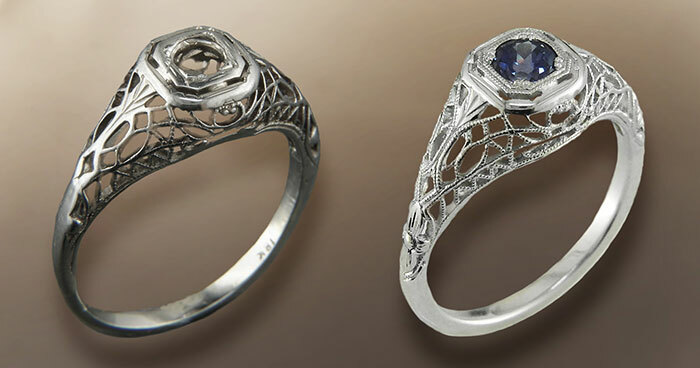 Though, after it was brought to a Green Lake jeweler with a specialty in restoring antiques like these, the delicate Old World wire work was painstakingly rebuilt. 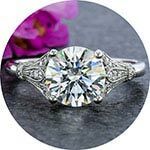 The shank of the ring was remade with critical attention to historical details, the milgrain was restored to its original crispness, and the center setting was crafted once again to finally be complete with a gemstone fitting a classic. 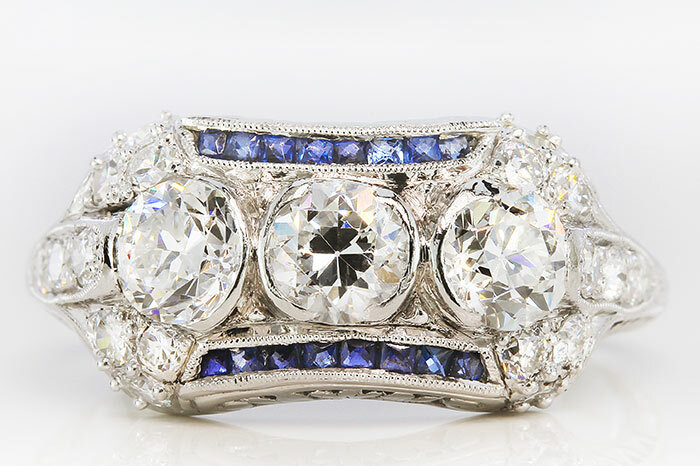 Originally thinking this Victorian-era engagement ring was beyond repair, the client requested the diamonds be used to create a entirely new ring on account of their sentimentality. 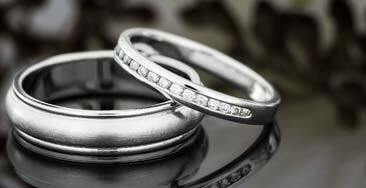 Upon learning however that the ring could be restored with relative ease, they decided to keep their family ring. 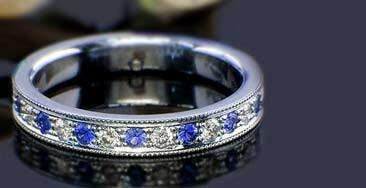 To return the ring to its original state, the bottom half of the shank was re-fabricated and re-engraved, the channel holding the side sapphires was re-built and broken sapphires even renewed with custom-cut replacements. 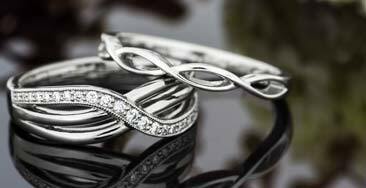 Are we the most skilled shop for jewelry repair around? We think so! 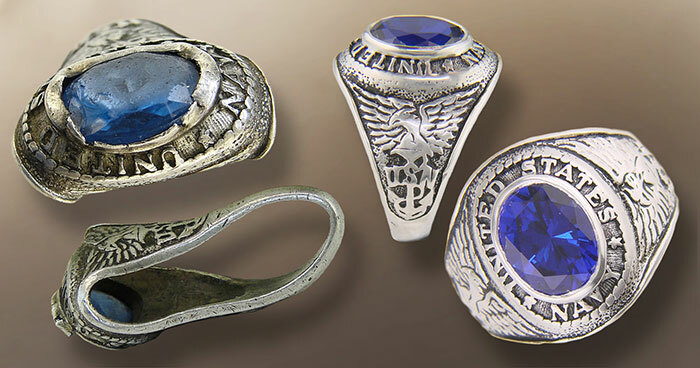 At least, that’s exactly what this veteran of the U.S. Navy thought after seeing this sentimental ring amazingly restored in full. 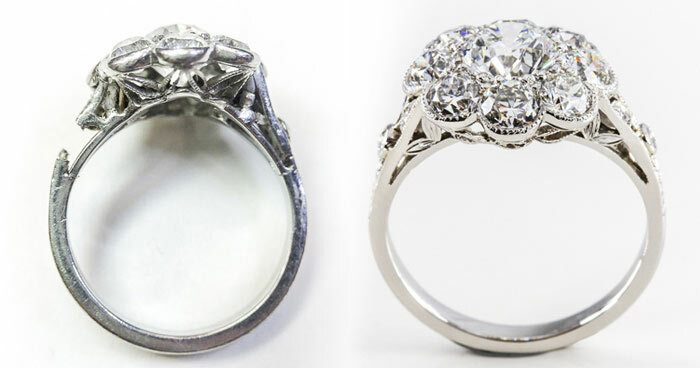 Despite having been run over, the center gem was still intact and a Green Lake restoration specialist was able to spare the original details while reshaping the ring with stronger materials and re-cut center gem to last a lifetime. 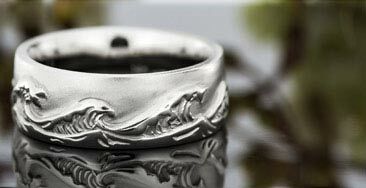 It’s almost hard to tell what the setting style on this ring even was previously, with each prong warn and the last completely torn off. 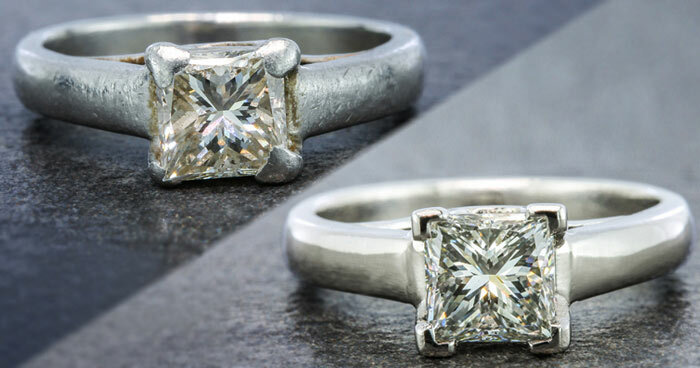 A new finish and sturdy chevron prongs adhered directly to the existing ring updated the piece and ensured a reliable setting for its precious gem. Can you tell which one is the original? 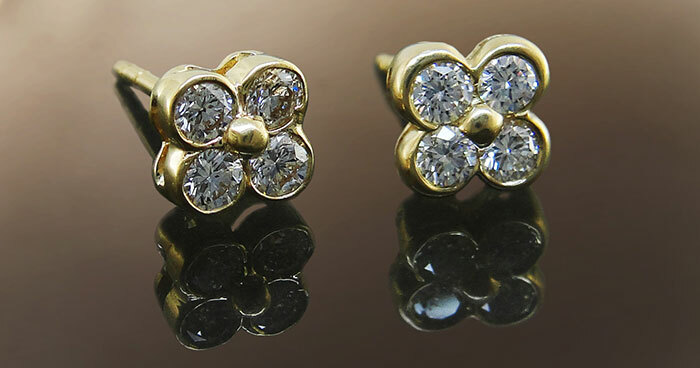 Originally purchased from a celebrated American jewelry designer, the owner of these gold and diamond earrings experienced the familiar fate of many; she lost one. 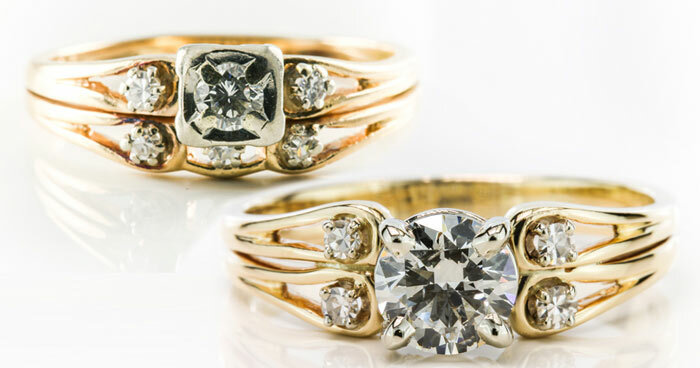 Rather than purchase a new pair, she sought out a Green Lake Jewelry Works restoration specialist to recreate a perfect match and uphold the sentiment of this original pair. 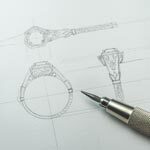 Sourcing diamonds directly, we were able to not only offer a mirrored design, but also source diamonds of the same quality. 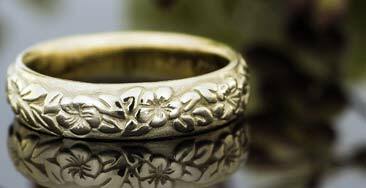 Green Lake Jewelry Works can repair your jewelry! 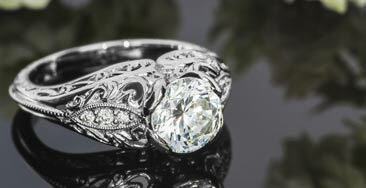 Just contact a designer specializing in restorations directly. 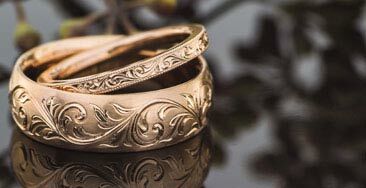 Whether you come into our Seattle or Bellevue studio, or work with us online from anywhere in the country, we can provide estimates quickly and make your jewelry good as new. 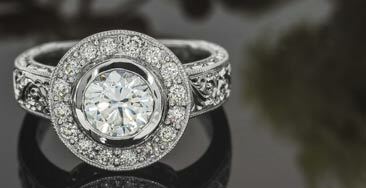 Adding a larger diamond center to some rings is not as easy a job as it may be for others. 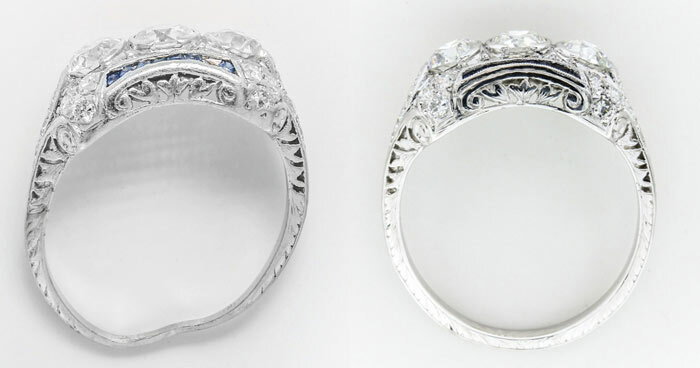 In the case of this ring, a new four-prong head needed to be custom fabricated for a diamond four times the size of its predecessor, yet allow for the engagement ring and wedding band to still sit together side-by-side without interference. 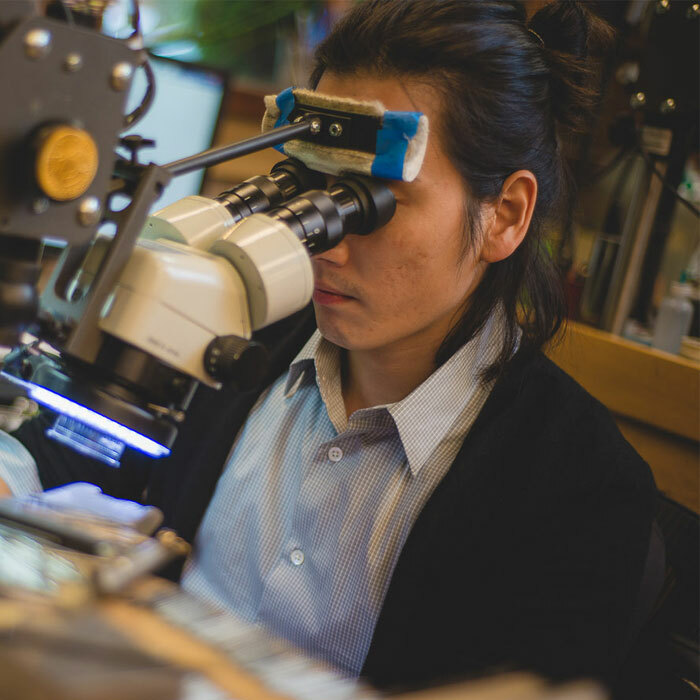 At Green Lake Jewelry Works, there are over 20 jeweler’s benches, and each are equipped with the industry’s most advanced microscopic technology. 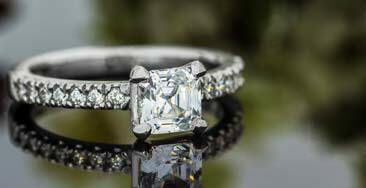 Green Lake Jewelry Works’ repair specialists give one specific estimate for repairs and we stick to it. 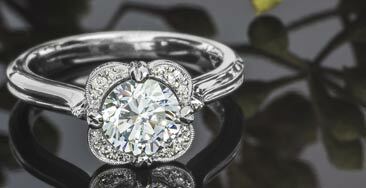 Additionally, we offer professional imagery of before and after of the piece upon pick-up. 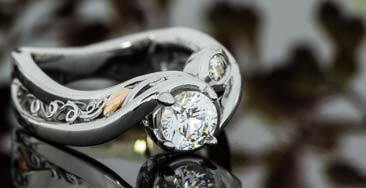 Perhaps most importantly, we offer a one-year guarantee on the work done, full stop. 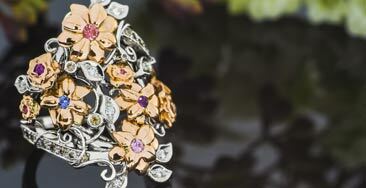 If your piece is of great value and sentiment to you, don’t you want to know who or where your property is going to? 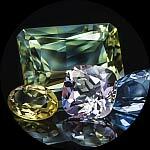 The jewelry industry has changed a great deal in recent years and few jewelers actually do their own work. Instead, they will send it out (sometimes even out of state) for someone else to do. 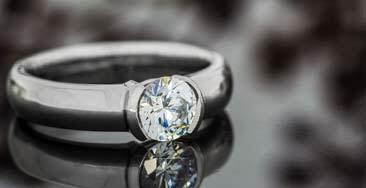 Make sure your ‘jeweler’ can work on fine pieces, not just sell them. 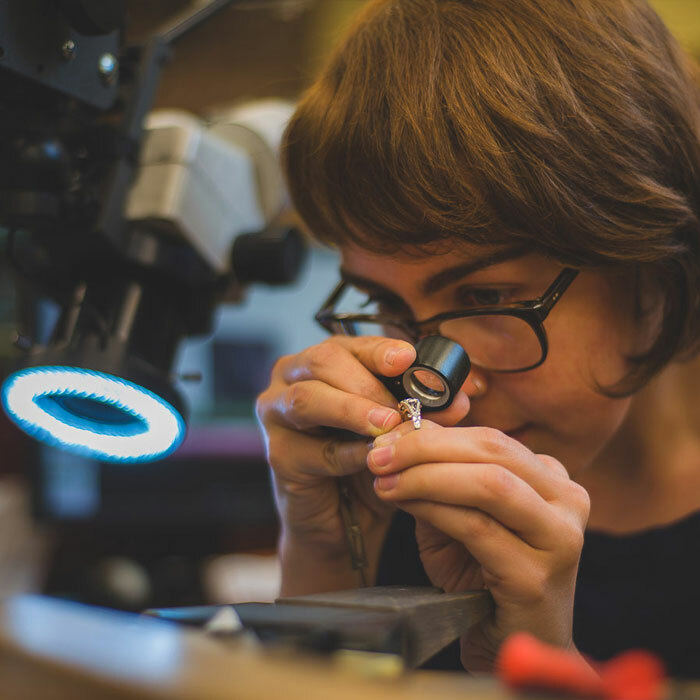 Because Green Lake crafts every piece of jewelry right here in the open workshop, you can be assured your jewelry will be repaired on site – and you can talk about the piece directly with the jeweler who will fix it. 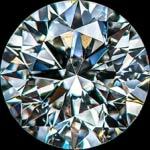 How do you know if a jeweler is trustworthy? 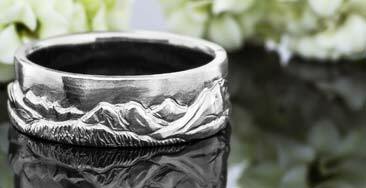 Well, they should have the experience to work on anything from a class ring to an heirloom estate piece. 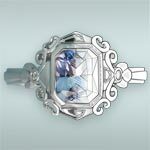 They should be open to having you present in the store while replacing a gemstone. Perhaps most importantly, they shouldn’t sell you on fixes you don’t need or guarantees you shouldn’t have to pay for. 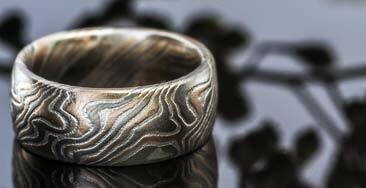 Green Lake Jewelry Works is a place for artists and craftsmen, not salespeople. 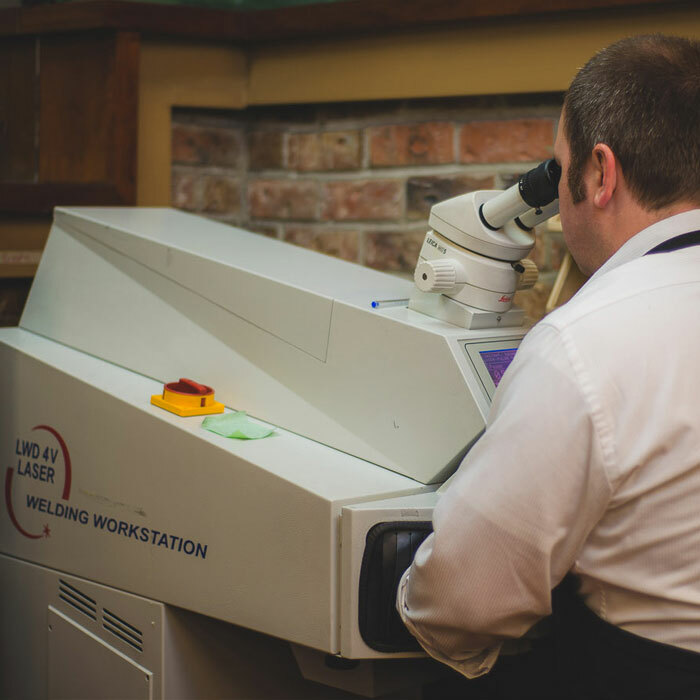 We collectively have over 500 years of jewelry experience all in the same workshop, so just about any challenge is met with confidence. 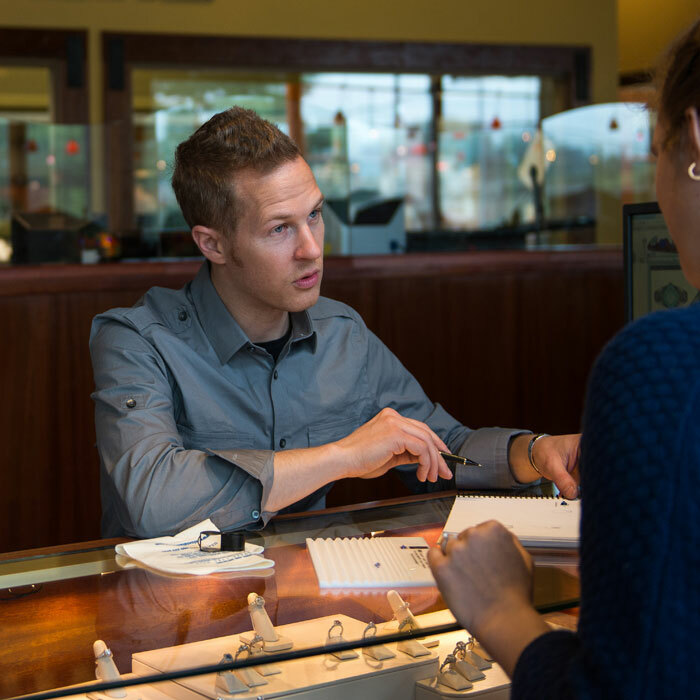 We think we’re one of the best – and most trustworthy – places to bring in a jewelry repair, and we look forward to working with you!